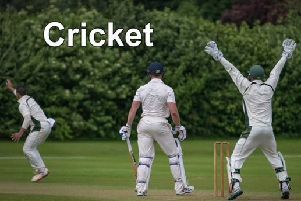 Woodhall Spa CC’s Second XI earned a 49-run success at Freiston, Leake and Leverton on Sunday. The result leaves them third in the South Lincs and Border League Premier Division, 31 points behind leaders Spalding. Sam Cherry (26), Danny Wells (18) and Matthew Sargeant (13) led the way with the bat as the away side ended their innings on 100 after being dismissed in their 32nd over. However, the hosts were soon dismissed for 51 with less than 23 overs played. James White claimed seven wickets for the loss of 23 runs, while Will Sharpe added two victims. Jack Hughes chipped in with a run out as Freiston were skittled. Woodhall’s First XI saw their Lincs ECB Premier contest against Bourne abandoned on Saturday following the rainfall. After 40 overs Woodhall were on 149-9, Harsha Vithana (83), Prasanna Jayawardene (52) and Henry Wilson (23) performing well. On Saturday the Firsts travel to Louth (noon) while a day later the Sunday Firsts host Boston (1.30pm).